The Stamina Body Trac Glider 1050 Rower is a compact and highly portable way to give yourself an incredible workout at an affordable price. This rower is especially great for those with limited space. Its compact design has a footprint of only 23 1/2 inches wide by 46 inches long, with arms that fold down for easy storage. Rowing has become an extremely popular way to workout due to its tendency to not only increase your cardiovascular fitness, but allows the rower to achieve a full body workout that is low-impact and efficient. Featuring a steel frame and an aluminum center beam that is designed to hold up for years to come, the Stamina Body Trac Glider 1050 Rower gives you a stable and comfortable workout. Another great feature of this particular rower is its multifunctional fitness monitor that shows your speed, distance traveled, time spent on the rower, stroke count, and the calories you have burned during your workout. This feature helps you stay motivated and helps you keep track of your accomplishments in order to reach your fitness goals. The seat is made of molded plastic, which may leave a bit to be desired in the comfort department. The rower’s handle bars are equipped with your standard padded grips, which are perfect for a comfortable hold while still letting you maintain a firm grip on the arms. The rower’s ball bearing roller system and easily adjustable hydraulic cylinder resistance arms realistically mimic the motion of rowing on the water, while its smooth gas shock resistance helps you maintain a rhythm that suits you. This rower also offers 12 different levels of resistance. Level 1 is easy and perfect for anyone new to rowing, or just working out in general. The higher the resistance level, the more intense the workout will be. Level 12, the highest level you can choose, will be challenging even to the most enthusiastic rower, and should not be tried until the user is comfortable with the machine. To adjust the resistance level, all you have to do is adjust the setting on the gas-shock. You have to be careful though – as stated in the owner’s manual. With its easy assembly and its folded measures of approximately 49 1/2 inches by 11 3/4 inches by 9 1/2 inches, the Stamina Body Trac Glider is a user friendly option for every type of buyer and rower, no matter their skill level. 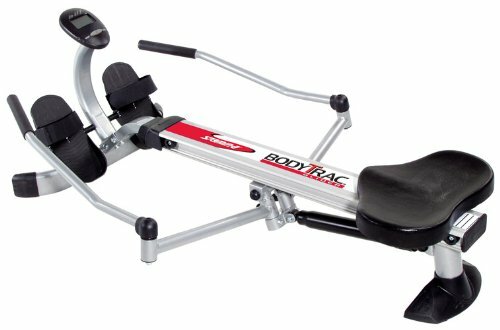 Stamina Body Trac Glider 1050 Rowing Machine, Stamina Products, Inc.